So…remember a week or so ago when I posted the ridiculously healthy, vibrant green smoothie? Well, I DO love that smoothie and I DO feel quite healthy when I have one. But I would be wrong not to confess that my favorite smoothie is slightly more…um…sinful. 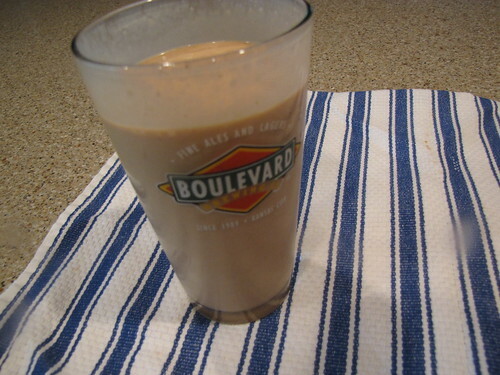 bananas, vanilla yogurt, milk, peanut butter, and if we’re being honest, chocolate syrup. 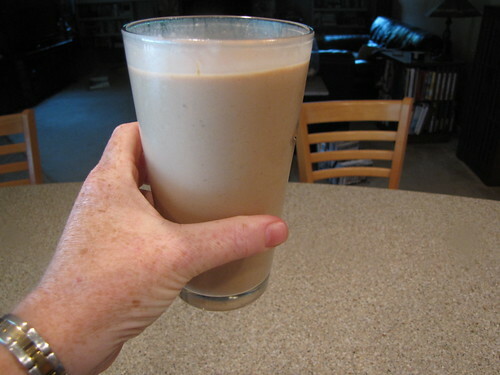 2 smallish ripe bananas broken into chunks meet about 1/3 cup of yogurt and 2 Tablespoons of milk. 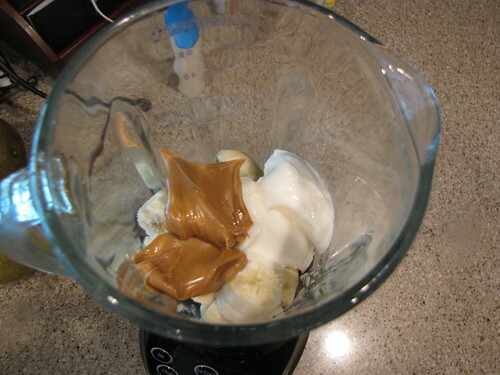 Add a couple of Tablespoons of peanut butter (get sugar free, freshly ground peanut butter for more flavor and less guilt) and about 1 Tablespoon of chocolate syrup. Throw in about 1/2 cup of ice and give it a whirl. Use the pulse function if your blender has one or stop and start the blender a couple of times to get all those bananas blended. Pour it in your favorite beer glass (???? I don’t even drink beer but Boulevard is from Kansas City!) and sip away. 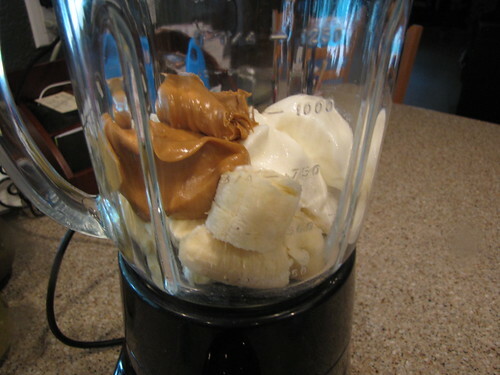 My crazy ice cream brain is usually very happy with the Peanut Butter Banana Smoothie. Back to kale some other day! I will have one, please! This looks so stinking good I can hardly stand it!!! 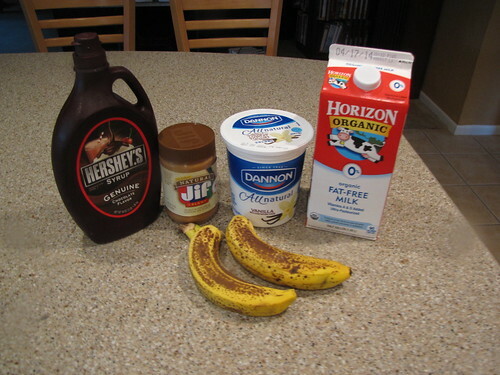 And if you freeze the bananas first, it makes ice cream. It’s odd; when you first begin to blender the bananas, they look kind of like bread crumbs. But trust and give them some more whirls and suddenly they’re creamy. Add flavors or eat it plain. 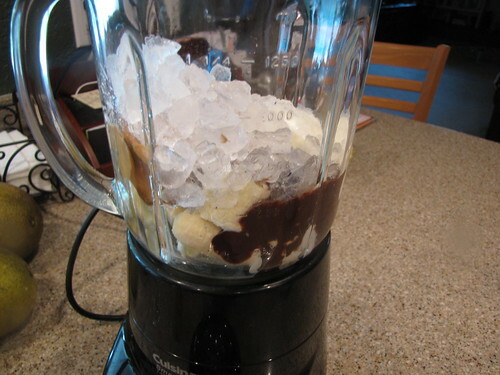 I’ve been wanting to try the frozen banana blender trick. Good to know that it works. Seems bizarre but I’ve heard it’s like banana ice cream magic. Of course, I’d probably have to add chocolate so there goes the ultra-healthy version.